Philadelphia 76ers forward Hollis Thompson (31) grabs a rebound against Milwaukee Bucks forward Caron Butler (3) in the first quarter at BMO Harris Bradley Center. MILWAUKEE (AP) — A little veteran leadership got the young Milwaukee Bucks back on the winning track. Caron Butler scored 22 points, grabbed 11 rebounds and dished out four assists in his return to the lineup after missing 12 games with a swollen left knee, leading the Bucks to a 106-96 victory over the Philadelphia 76ers Saturday night. "The thing this team has desperately missed from him is his leadership," Milwaukee coach Larry Drew said of the 12-year NBA veteran. "Throughout the game he was on the court talking, pumping his teammates up. We had a couple of bad stretches, but he kept the guys positive. That’s something we’ve missed with him being gone." The hot-shooting Bucks recovered from consecutive overtime losses to pick up just their sixth win of the season. Khris Middleton scored 27 points and Brandon Knight added 21 points and six assists for the Bucks (6-21). Butler played nearly 40 minutes in his return, something that Drew said wasn’t part of the game plan for the chronically short-handed Bucks. "Coach stayed in my ear consistently the whole game asking me how I felt," Butler said. "I got a rhythm early. We had the game under control from the beginning." Milwaukee, owner of the league’s worst record, led most of the game and built a 19-point cushion early in the fourth quarter, matching its largest lead in any game this season. The 76ers pulled within seven with about one minute remaining, but the Bucks converted 10 consecutive free throws to secure the win. Butler praised Middleton, a second-year player, and rookies Giannis Antetokounmpo, who had 12 points and seven rebounds, and Miroslav Raduljica, who contributed a season-high 14 points. "(Middleton) did a great job of loosening up everything. He was finding pockets and getting in the paint and hitting floaters. I thought Giannis did a great job continuing to run the floor. (Raduljica) was huge. He was banging down there and making good decisions and keeping the ball high and not turning it over." The injury-depleted Bucks played without starting center John Henson, who bruised his knee in a collision with the Cavalier’s Anderson Varejao in the loss at Cleveland Friday night. Henson’s absence left Middleton as the lone Milwaukee player to appear in all 27 games this season. Raduljica, who has played sparingly at times this season, filled in nicely in Henson’s absence. "I’m here to help and I think I’m doing that every time I get a chance," Raduljica said. "We had two really unlucky losses and we had Caron back with great energy and he gathered us around him and everybody took part of his energy and that allowed us to win." Thaddeus Young had 30 points and 10 rebounds to lead Philadelphia. Spencer Hawes added 25 points and 11 rebounds. Both teams were coming off overtime games Friday. The Bucks lost 114-111 at Cleveland, their fifth consecutive defeat, while the 76ers nipped the Brooklyn Nets 121-120 at home. "As a group, our only hope to play some semblance of NBA defense is by committee," 76ers coach Brett Brown said. "When different pieces go missing, or it is not a collective toughness and focus, then we are vulnerable. At times we were vulnerable tonight. In general, trying to find 48 minutes worth of defense has been a problem." 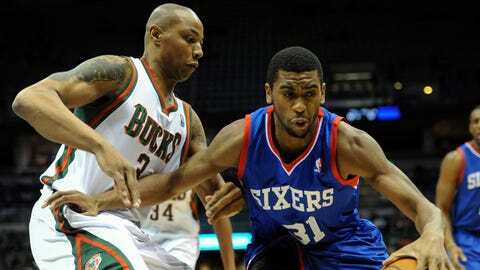 The Bucks shot 52 percent from the field for the game, compared with 41 percent for the 76ers. "You are not going to win a whole lot of games giving up that kind of efficiency to the other team," Hawes said. After trailing by 10 at the half, the 76ers opened the third quarter with an 8-0 run. The Bucks regained control with a 15-4 run midway through the quarter and held an 85-72 heading into the fourth. Middleton led the Bucks with 10 points in the quarter. The Bucks held a double-digit lead for nearly the entire second quarter, growing their margin to as many as 15 with two minutes remaining. Milwaukee, bolstered by 51 percent shooting over the first two quarters, held a 59-49 lead at halftime. Knight had 17 first-half points, while Butler added 13 points and seven rebounds. Young had 15 points and eight rebounds in the first half for Philadelphia, which shot just 40 percent. The Bucks grabbed a 29-23 lead after the first quarter, paced by Middleton’s seven points. NOTES: Philadelphia has lost 12 consecutive road games. . Former MLB star and one-time Milwaukee Brewers executive Sal Bando visited Bucks’ coach Larry Drew before the game. "Sal played in Kansas City, which is where I’m from. He was one of my heroes. I came up playing baseball. It was my passion. Basketball was secondary," Drew said. . The Bucks used their 15th different starting lineup in 27 games this season.